Continuing the all-new line of MASSIVE Dynamite Omnibus Editions! Designed for reading (or, in this case, DEVOURING) a HUGE chunk of awesome Dynamite Comics in one sitting! 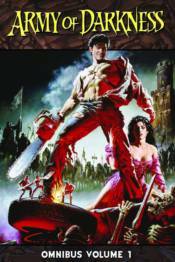 This time around, Dynamite presents the first 18 issues of the acclaimed Army of Darkness series in one massive omnibus! Featuring the movie adaptation based on the screenplay by Sam and Ivan Raimi, and illustrated by John Bolton, as well as the first four story arcs from the ongoing series -- Ashes to Ashes, Shop till You Drop (Dead), Ash vs. Re-Animator, Old School, and the shorts stories presented in Tales of the Army of Darkness! Featuring the work of Andy (Danger Girl) Hartnell, James (Freddy vs. Ash vs. Jason) Kuhoric and so many more (including a short story by Robert (Walking Dead) Kirkman! Also includes a complete cover gallery!